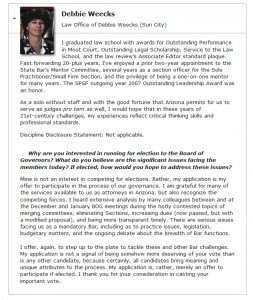 There have been ongoing developments of import witihin the State Bar of Arizona regarding governance. With the discussions about the unified Bar, funding, electronics, and so on, the year 2014 elections for the Board of Governors offered a full slate of nominees. Ms. Weecks was happy to participate in the process and the discussion. The below links and reproductions preserve some of the important questions that were posed during the election process. For updates on important issues, check back in here periodically.